Some recipes are not just black and white words. They are full of heritage and evoke strong memories, even when you just say the name. Braciole is one of those. 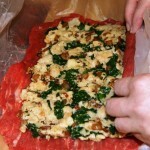 The ‘recipe’ for how to make this Italian dish varies from region to region and family member to family member. 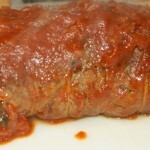 Some folks swear it is beef, sliced thin, then browned and cooked in a red sauce. 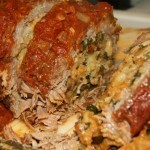 Others say it is rolled beef, stuffed. 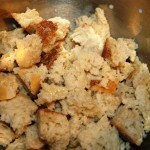 The stuffing varies from person to person, family to family. Not being of Italian heritage I don’t have those family traditions to draw on for this dish, only what I’ve tasted and seen and how I like it. I engaged hubby’s assistance in the project. 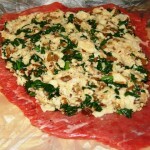 Since the flank steak needed to be pounded flat his muscles came in handy. I would have included a picture of him in the gallery but the only one I was able to snap was him flipping me the bird when he didn’t appreciate my sweet natured and loving correction when I thought he was going to put cooking twine in the garbage disposal. While he flattened the flank steak I assembled the stuffing. 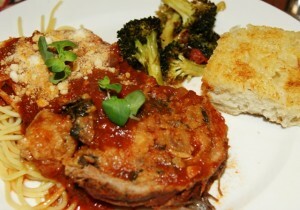 Then he took over the photgrapher’s duties while I stuffed it, rolled it and made the sauce. Twenty-seven years of marriage and, other than the occasional flipping of the bird or sailor word, we work well together in the kitchen. Flatten steak to an even 1/2 inch thick. Sprinkle with salt and pepper, set aside. In a large bowl mix bread crumbs and milk. Heat 2 tbsp of olive oil in a large skillet (I use a 5 qt chicken fryer). 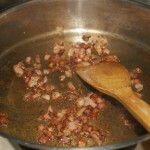 Add pancetta and cook until crisp. 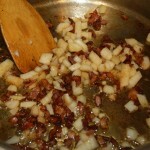 Lower heat and add a pinch of salt & pepper, 1/4 cup of onion and a minced garlic clove. Cook until translucent. 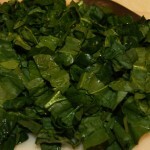 Add spinach and cook until wilted. 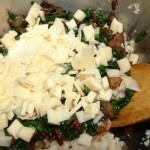 Add the pancetta mixture to the bread crumbs and toss lightly. Add the cheeses and toss again. Spoon over beef to within 1 in. of edges; press down. 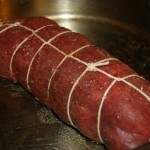 Roll up jelly-roll style, tightly, with the grain of the meat, starting with a long side; tie off at 1 inch intervals with cooking twine. 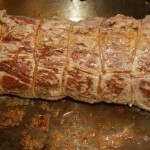 In the same pan that you cooked the pancetta in add the remaining olive oil and, over medium-high heat, brown the rolled beef on all sides. 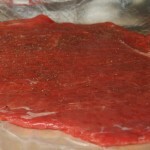 If using a slow cooker put the browned beef in there, if cooking stove top remove it to a plate and cover with foil. Over medium heat add the onion and cook until tender (add to the slow cooker if using, otherwise leave in the pan.) 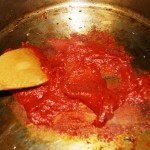 Add the tomato paste and cook until it starts to darken. Add the wine and deglaze the pan, being sure to scrape up all the good brown bits of flavor. Stir in the tomato sauce, oregano, salt and pepper. 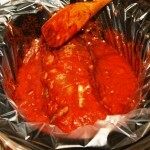 Slow cooker method: add all of this to the slow cooker, cover, on low for 8 hours. 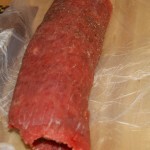 Stove top method: add back the rolled beef. Bring to a boil. 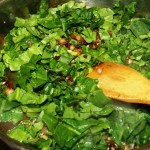 Reduce heat; cover and simmer for 70-80 minutes or until meat is tender. 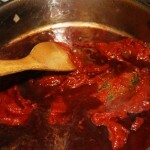 Remove meat from sauce and discard string. 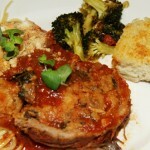 Cut into thin slices; serve with the sauce, spaghetti and Parmesan. Ronda, this is very good! It’s definitely something I’d love to eat! 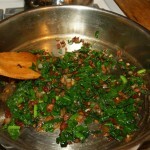 It’ssimilar to a Frugal Gourmet recipe I made numerous times long ago but yours sounds even better with the pancetta.